Find Your Outdoor Ceiling Fans Today! Your outdoor seating area has everything it needs, including chairs, tables, ambient lighting, and more. You’ve set up a literal paradise in your backyard, but when you sit out there during the first warm day of spring, you notice there’s no air movement and that it’s a bit uncomfortable after a few minutes. At Hortons Home Lighting, we can help you improve your backyard deck or patio with a new outdoor ceiling fan! One of the best ways to improve your outdoor seating area is to have proper airflow, no matter what time of day it is. As summer approaches and the humidity from Lake Michigan begins to roll across Chicagoland, it can be beneficial to have a fan running in the morning, at noon, or at night. 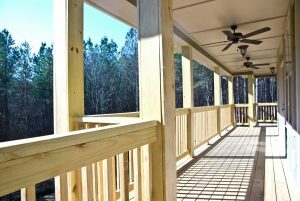 You might enjoy your first cup of coffee on your covered deck, but if it’s stuffy and uncomfortable, you may not spend as much time out there as you’d like. 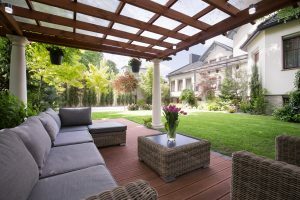 If you enjoy entertaining friends and neighbors during the summer, the temperature can rise quickly when you have a bunch of bodies in a small area, and an outdoor fan can keep everyone comfortable as they enjoy their barbecue and sip their drinks. One solution that many homeowners use to cool down their outdoor area is by placing portable fans around the deck or patio. While this can work, it often means you have to run extension cords and risk blowing the paper plates off the table if the fans aren’t correctly positioned. Outdoor ceiling fans with appropriately sized blades can move enough air to keep everyone cool and not disrupt the setup of your party. A ceiling fan with a light can add to the ambiance of your outdoor area, and putting the fixture on a dimmer control allows you to set the level where you want. The fan may already be on a variable speed dial, and adding a dimmer switch can improve the controls. Our staff can help you choose a fan with a light fixture that’s rated for outdoor use and that fits your personal style and budget. Our ceiling fan selection is very extensive, and we can help you choose everything from the fixture and bulb style to the fan blades. If you’re going for a tropical theme in your backyard, we can show you a number of leaf-style blades and other natural-looking options that will blend in perfectly with your home’s architecture. If you already have an outdoor fan, but the blades are looking a bit outdated, we can show you several modern options that can be a fast and affordable upgrade. When you’re shopping for new light fixtures or ceiling fans in Chicago, come to Hortons today. We have showroom locations in La Grange, Chicago, and Orland Park, and the staff at each location will gladly help you find exactly what you need. Before you know it, you’ll have an improved outdoor seating area with perfect airflow!